There is true sensitivity and then there is the sensitivity of illusion. And what is the sensitivity of illusion? This generation ought to know for it is continually thrown in our face by politicians, activists and lawsuits. Many pretenders are telling us they feel our pain when the only pain they really feel comes from the frustrations of their own selfish desires. Many are complaining their sensitivities are painfully offended because someone is innocently using some word or phrase that seemed to hurt no one in the past through 200 years of use, but now has become to them an illusionary dagger to their sensitive heart. Still others sue everyone in sight at the drop of a hat claiming millions of dollars of sensitive emotional damage and wind up looking so ridiculous that they make headlines in the National Enquirer. Such is not the way of the sensitivity of the disciple. The disciple is indeed sensitive and is highly aware of others’ feelings as well as his own, but the concerning selfish indignation that is infecting our society, he has none. All insults, real or imagined, all negative thoughts and feelings of others, and all attacks are registered in his physical brain and responded to when it fills a purpose, but he or she lets the negativity pass through him so his state of mind, soul contact and peace are not affected. The true sensitivity of the disciple is multi-leveled. Level One: He acquires a sincere desire to understand and help people and this directs his attention to their spiritual needs and concerns. 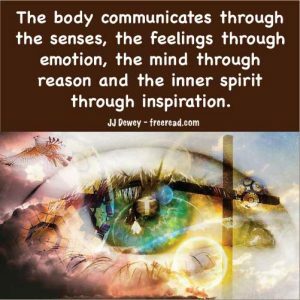 After a period of time this focused attention brings forth his soul abilities to tune into the emotions, feelings and some thoughts of those contacts. Level Two: The disciple becomes sensitive to the vibration of contact through the soul. These contacts will be the Higher Self or members of the Brotherhood stimulating your soul. This level is an octave higher than normal psychism that is claimed by so many. Most who have psychic powers believe they are at this level, but few are. This disciple learns that the difference between lower and higher psychism is not a difference between devils and angels. It is the difference between contact with well meaning human type entities and the higher vibration of the inhabitants of the Kingdom of God. Level Three: The disciple becomes sensitive to the difference in vibration of his Spiritual Self through the soul and contract from the Masters through the soul. Level Four: The disciple becomes sensitive to Spiritual Impression. Alice A. Bailey calls this the “science of impression,” but doesn’t tell us much about it. Spiritual Impression is indeed a science, but a science had by no recognized scientists on this earth. Instead it is a science studied in the halls of the greater lives called the Masters and beyond to even extra planetary beings. Through the use of the science of impression one of the Great Ones can transmit several books worth of information in an instant through the language of principles to the mind of the receiving disciple. Very few disciples have reached this point but many are preparing for it. Level Five: The disciple becomes sensitive to the Mind of God (for want of a better word). When this level of sensitivity is reached knowledge of all principles becomes available for the asking. There are other branch levels between these five and still others before the first level is reached, but this gives us a nutshell version of where we should aspire. Are there levels after five? Yes, but they would be meaningless for us to discuss. This leads us to another hint about the sixteenth quality. He who possesses it will be much more interested in the five levels of which he can have some conception, rather than things above level five that have no meaning to his present consciousness. He who has not yet arrived at full disciple consciousness will dwell on ultimate realities as if he has already arrived there, even if he has no comprehension of what they are nor can he communicate such realities to others by means of words of understanding. The sixteenth quality is balance. The disciple lives in the world but is not of the world. Even so he must live in balance with both worlds. The beginner will be so enamored with spiritual contact that he wants to take his attention off the physical world and dwell 100% in the spiritual to the exclusion of the physical. This causes a difficulty of communication between him and others in what is commonly called the “real world,” real to us anyway. When this happens he loses influence with his physical brothers and often winds up being viewed as a dreamer or a fruitcake. He thus ends up being of little use to the Brotherhood of Light because they need disciples as reliable points of contact in this world. I said earlier that this quality will often cause conflict between seekers in contact with the disciple. Why do you suppose this is? Can you think of other reasons why this balance is so essential?